Experience the difference quality makes. Our ultimate hard bar is the Sudsiest creamiest, gentle soap for your whole family. Our classic handmade natural soaps and other bath & body products are made from the highest quality pure skin-loving oils such as Olive, Coconut, Canola, Avocado & Jojoba oils. We also use rich butters like cocoa and shea in some of our bath & body products. Our handmade natural soap is made using a method called cold process, in small batches, from scratch, hand cut and cured for 4-6 wks before packaging. Yes we bring our cold process soap through the gel stage as we feel this creates the ultimate hard bar that is gentlest on your skin. Each bar is trimmed and wrapped by hand with care. We have now added our line of Goats Milk soaps, these soaps have been popular for years at our markets, we only make them twice a year spring and fall, when they're gone they're gone! Our soaps are about 25% larger than the average handmade natural soap in the marketplace today. Sisters soaps are biodegradable and river friendly. We use minimal packaging and printed material. Please note when selecting Quantities & Savings option (3-5 bars) your order will come up without a scent choice attached. Once you have decided what type of soaps you want from both soap pages, simply let us know which scents in the "Instructions to merchant" which will come up when you have completed the payment option on shopping cart. Handmade Natural Soap Quantities & Savings option 3- bars That's $6.25 a bar! 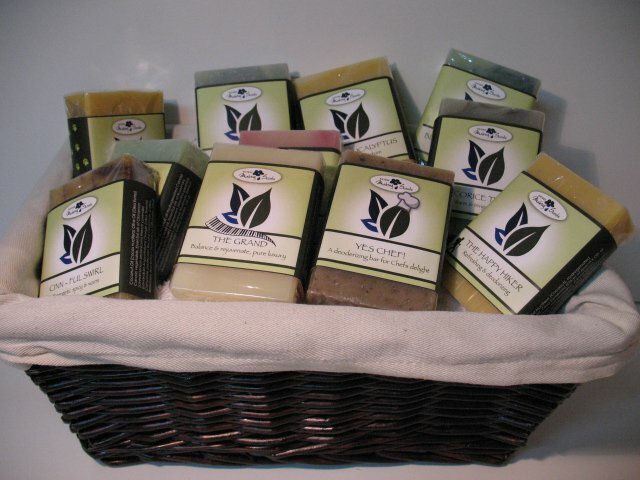 Handmade Natural Soap Quantities & Savings option 5-bars That's only $6.00 a bar! Pure luxury. 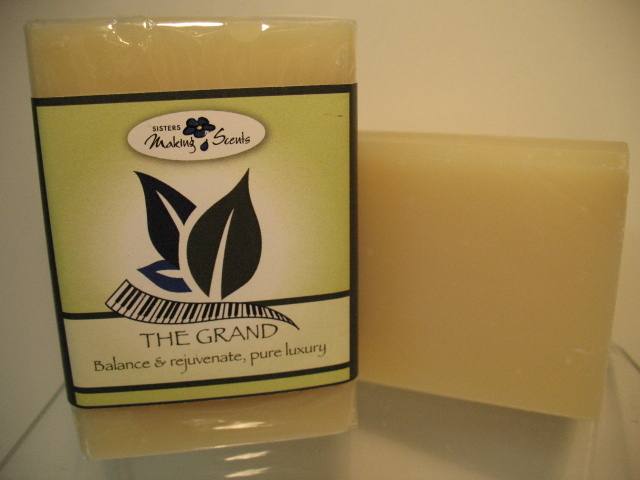 Baby your skin with this grandest of soaps. A magical blend of some of the best essential oils for sensitive skin. Inspired by a friend, (a pianist) who because of his sentivie skin could not use soap since childhood. Baby Grand was born. Well, Baby Grand grew up and is now known as, The Grand! of the oldest universal favorites in soap & many other products. This bar is peppered with a lovely deep lavender colour. 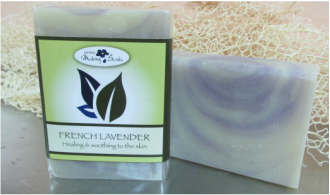 Lavender is known as the angel of healing, excellent for all skin conditions. Jump start your day with this invigorating bar! 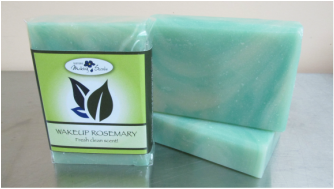 Wakeup Rosemary has a new fresh clean scent! Stimulating & uplifting, it's also an excellent astringent with toning action. The earthy colour of this bar suits its qualities. helpful for eczema. 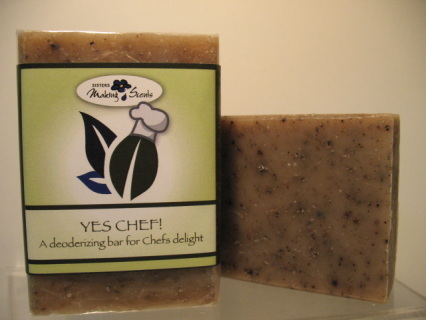 Although this may look like an exfoliating bar the herbs stay wonderfully soft with increased lather. Still my favorite soap for over 14+ yrs. Caution: Known for its aphrodisiacal qualities. Anti-Viral by nature this fresh & energizing soap not only smells divine. It contains a synergy of essential oils known to be anti-viral & aid respiration. May be helpful during cold & flu season. Refreshing & deodorizing. 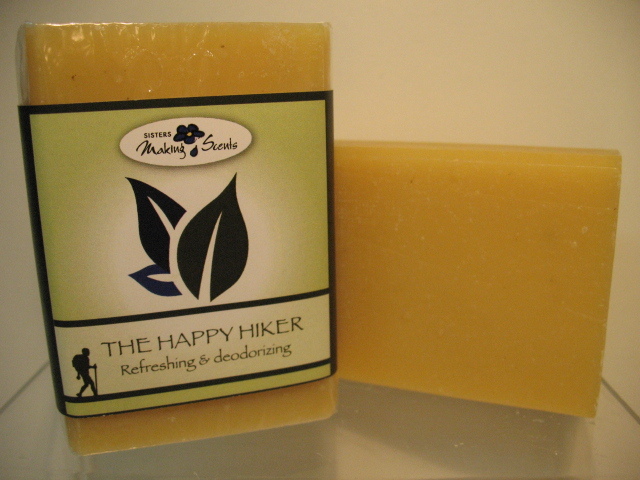 Not only a great conditioner for summer skin but may help keep pesky insects at bay when used with our Happy Hiker all natural insect repellent for complete coverage. A popular uplifting soap all year round! For bite free camping and hiking this summer use with ouor Happy Hiker Spray! Made from Saponified Coconut, Canola Vegetable & Olive oil with a senergy of essential oils that include Lemongrass, Lavender & Peppermint, Rosemary extract, and Iron oxide for colour. This minty coffee delight rids your hands of those not so nice smells like garlic, fish & onions. The mint oils are a great pick me up for those stressful VIP dinners! CAUTION: Don't let your diner guests catch you sniffing the soap! Gardeners and Artists love this soap too. It's excellent Exfoliating action cleans garden hands and art brushes beautifully. ​Made from Saponified Coconut, Canola vegetable & Olive oil with a senergy of essential oils that include Peppermint & Spearmint, fresh ground french dark roast coffee, Rosemary extract. ​A refreshing natural way to clean your dog. Formulated with oils that are known for their healing properties and are natural insect repellients. A PAWS down winner & we have our dog Gunners permission to say so! Created with oils to give your dog a silky, healthier coat and essential oils that smell wonderful and are healing. Many of our customers tell us that their dogs enjoy the feel of this natural conditioner on their skin and coat and are not in a hurry to roll or lick it off once dried. Our fresh goats milk soap is creamy, healing & soothing to the skin. Teamed up with hydrating Shea Butter this "Mint Blossom" is a cooling fresh synergy of pure essential oils of French Lavender and Spearmint. Made with fresh goats milk not powdered milk. Our Desert Blossom is a swirl of fresh ground Rosehips and Calendula blossoms in a pool of Patchouli, Geranium, French Lavender & clove essential oils which make this soap smell like a warm desert wind. Yum! Our Seasonal Soaps are back! 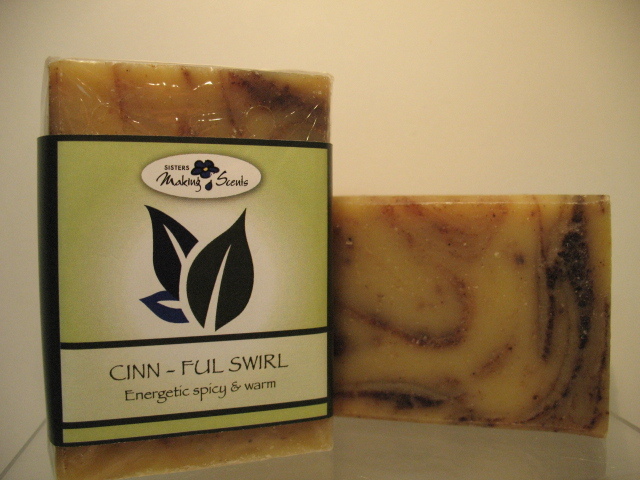 An aromatic delight with its warm spicy cinnamon swirl & a synergy of pure essential oils. 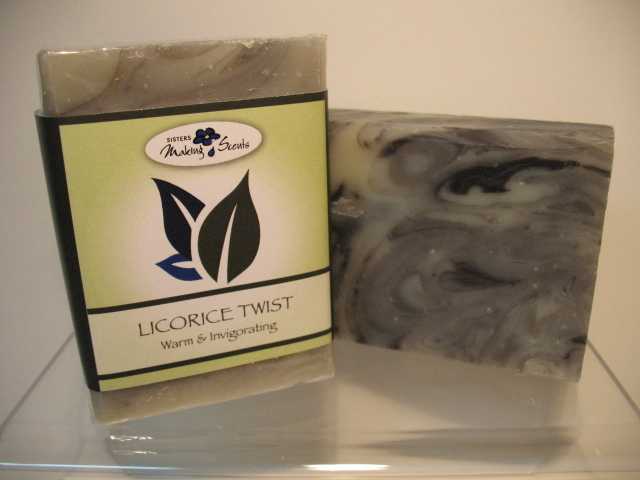 This energetic bar is enhanced with Camomile for its soothing, healing properties. Warm & Invigorating! This spicy blend of essential oils known for its stimulatiing tonic actions on the body. Aniseed & Fennel may also be helpful for wrinkles, holiday excess, hangovers & lucky for fishermen! Made from Saponified Coconut, Canola Vegetable & Olive oil with essential oil of Aniseed, Rosemary extract, Iron oxide for colour. They arrived today! Thanks for the prompt service. 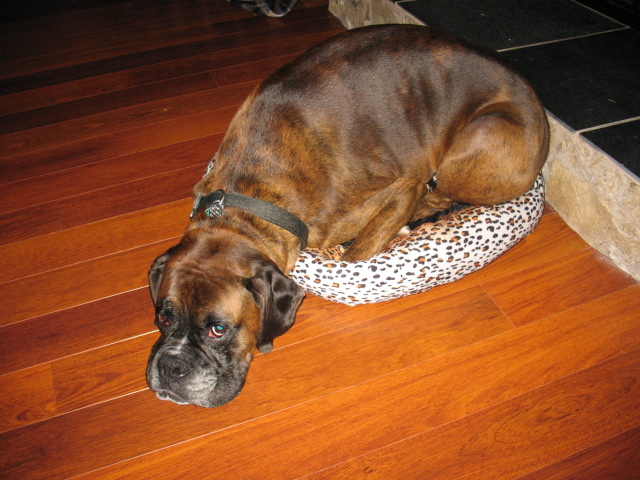 Ahh...Gunner, the cats bed is too small for you!